During the fight, Jack notes how much more powerful Spider-Man is in his new suit—another hint that there’s more to the black costume than meets the eyes. Meanwhile, Aunt May’s boyfriend Nathan Lubensky totally has Peter Parker pegged. May is giving Pete the silent treatment since he dropped out of school, so Nathan tries to help them reconcile but Peter misses the date (due to the Jack O’Lantern fight). Nathan then throws some guilt on Pete’s shoulders. Yeah, guilt has always been his cross to bear. Also, I know he has his detractors, but I really like Rick Leonardi’s work on Spider-Man. 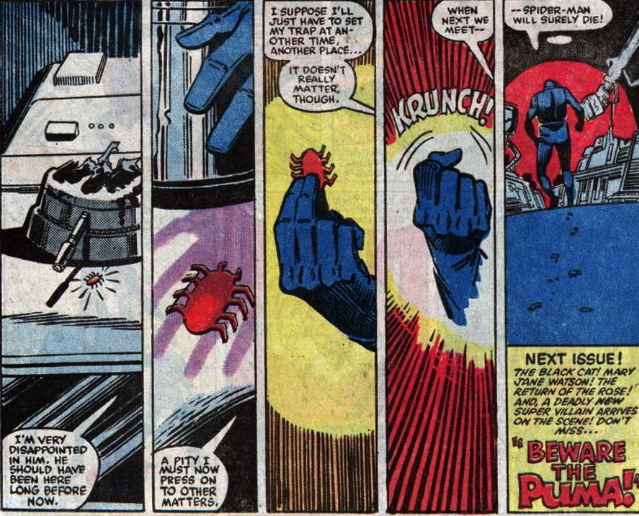 All that and the first appearance of Black Fox!